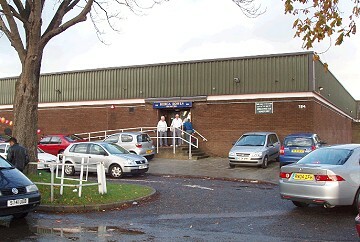 Herga Indoor Bowls Club is located in Wealdstone, Harrow, adjoining the Harrow Leisure Centre in Christchurch Avenue. To view our location, please view the Find Us page. 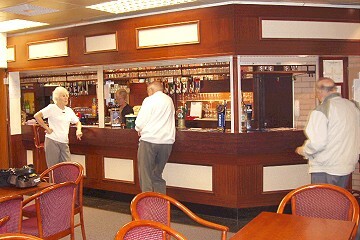 The club was opened in 1984, and the membership now stands at about 320 men, ladies, social and junior members. We are affiliated to the English Indoor Bowling Association, Middlesex County Indoor Bowling Association, and the London & Southern Counties Bowling Association. Harrow Council has introduced pay and display for general use. The general public, including Herga members and visitors, will get one free ticket per day allowing a 3 hour stay. The parking meters allow visitors to add to the 3 free hours at 80 pence per hour up to a maximum of 5 hours (8 hours total parking). The cash can be paid at the first visit. The pay and display remains in force for 24 hours weekdays and weekends. The private car park in front of the club will remain for the exclusive use of Herga members and visitors. We have six rinks (36m x 4.7m) of Greengauge carpet laid on a wooden floor. The carpet is 'stretched' at the beginning of each season in order to maintain the highest quality County standard bowling surface. Newly installed LED lighting ensures a bowling surface illumination of the highest quality. Spectators are able to view the rinks from a raised area which comprises seating, a well-stocked bar and dining area. 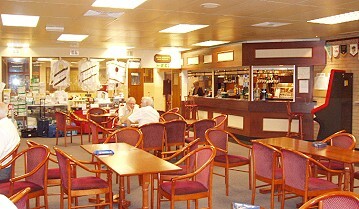 The catering is run by full time staff and the bar is managed by volunteers. Members and guests can enjoy pre and post-match refreshments of the highest quality. During the day rinks are usually “booked” for members playing in various leagues or competitions. The leagues are organised into Men’s, Ladies and Mixed, either in fours or triples format. There are also evening leagues to accommodate those members who work during the day. On weekdays some rinks are set aside for “roll-ups”. This is very popular with all members, even those who play in leagues. 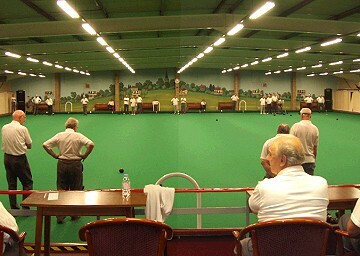 Both ladies and men play friendly inter-club matches with other clubs and bowling associations. These matches are usually played on Tuesday, Thursday and weekend afternoons. Herga is a very competitive club and enters teams for most County and National competitions. Individual members (men and women) are encouraged to enter all formats of County and National competitions. We are always seeking new members and whether you are an experienced or a new bowler you will be made very welcome. For new bowlers we organise a coaching scheme run by experienced county coaches. Annual subscriptions for the 2018/19 season are £120 (Full membership) and £15 (social membership). There are special rates for juniors and up to age 18. Session fees are £3.00 for 2 hours and 15 minutes.